I went snowshoeing in the New Hampshire woods this weekend! I was worried that my weak knee wouldn't behave, but it was fine. 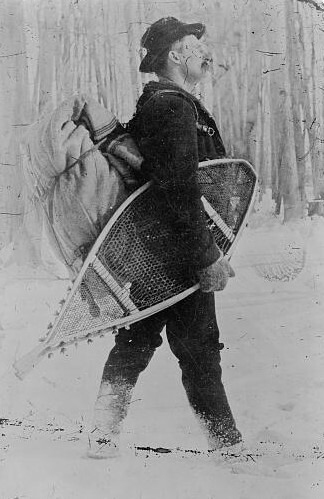 Also, I assumed that snowshoes would be the old wooden kind, like in the picture. Nope. Now snowshoes are made of aerodynamic composite material, like skis. All my assumptions were wrong. How many other stroke assumptions are wrong? Maybe I should try skiing? Ice skating? What else?